You planned a great trip to an exciting destination—but travel day turned up overcast and drizzly. You rescheduled because of weather, again…if only you had your Instrument rating. Now Aero Safety Training’s flight school makes it easier to accomplish that challenging goal, with a comprehensive program that is rewarding—and downright fun! Once you obtain your Instrument rating, you’ll be a safer, more competent pilot. Unexpected clouds will become less daunting, and you’ll enjoy flying more-even in VFR! The Cessna Instrument Course, developed by King Schools, includes multi-media lessons, followed by fun, interactive questions and flight-preview videos for every skill you will master. You also have access to a complete FAA knowledge exam review program. The course is web-based, so it’s available anywhere you have internet access. Your personal login will maintain a record of which sessions you have completed and will allow you to continue where you left off when you return. And your course never expires, so you’ll have access to all of the in-depth knowledge sessions and flight previews and can review important topics even after you have completed your training. One great feature of this course is the ability to watch each task you will perform with stunning in-flight video before you show up for your lesson. Your video instructor will walk you through everything you need to know to immediately feel comfortable in the airplane or Redbird Full Motion Flight Simulator. This will help set you up for success and will enable you to progress quickly to become a safe, competent and confident Instrument-rated Pilot! 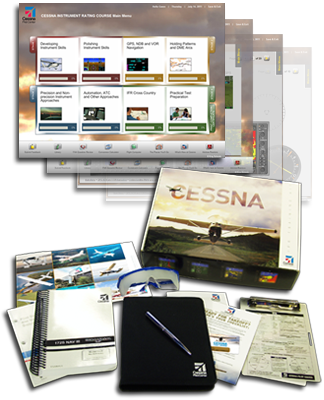 Purchase now and you will receive a customized Cessna training kit that will include everything you need to begin your journey toward achieving your Instrument rating. It’s what you’ve been waiting for. So start today and reward yourself with the freedom you deserve. Get your Instrument rating and you’ll be soaring above the clouds!